If there is a monochromatic outfit I want to wear, I always lean towards wearing a white monochromatic outfit. Something about wearing the right combination of whites together makes it so rewarding. And when you find the right clothing items to wear together it is so exciting to see how one color can look so chic! 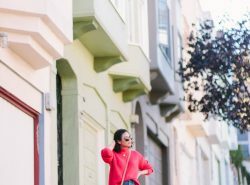 I wore this outfit when we were in San Francisco exploring the Nob Hill neighborhood. I figured the all white would look great against San Francisco’s colorful buildings and I was right! 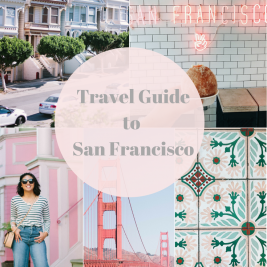 Seriously though, if there is a place that is perfect for a monochromatic outfit, it is SF! Whenever I wear a white on white outfit, the first reaction I get is “I don’t know how you can wear white. I’d be so scared to get it dirty.” I find the challenge of wearing white so thrilling. Maybe because I am not an adventurous person I find this thrilling, but if I can do something most people say they can’t see themselves doing (or in this case wear), I call myself a daredevil, haha. So I guess you can say I am a daredevil when I wore my favorite white tee and off the shoulder sweater. Can you tell I love wearing these white jeans almost every time I decide to go monochromatic white? These jeans are the best and I can’t recommend them enough. And it doesn’t break the bank – only $36! The other challenge with wearing a monochromatic white outfit is that not every white piece worn together works. It is all about finding the right pieces. I have quite a bit of whites in my closet so I was able to experiment a lot with creating a monochromatic white outfit. With that said, here are my tips on how to wear a monochromatic white outfit that works. Different textures create dimensions in your outfits. The textures help create a separation from the top and bottom and helps accentuate your more flattering features. The different textures create an illusion similar to wearing a top and bottom with different colors. Don’t be afraid to pick pieces that have prints and/or patterns. It adds personality to your outfit. When an outfit has personality, it creates style. You can choose a print or pattern in the same monochromatic color or choose something as a pop of color. 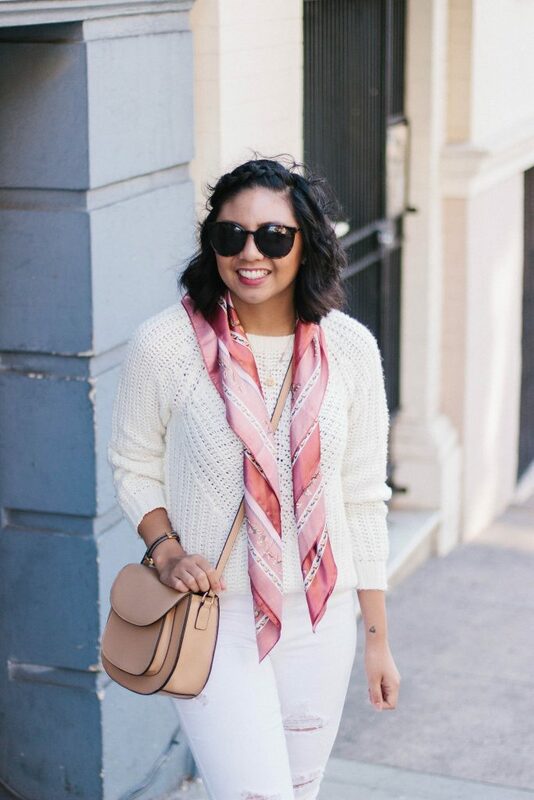 In this outfit, I decided to choose something patterned from a silk scarf and went with blush hues. Having balance is important in almost every outfit but especially a monochromatic white outfit. Sometimes wearing one color can cause you to hide in the outfit. So the trick is to balance the top and bottom. For instance, if you are wearing a loose white blouse, pairing it with a more fitted pants like skinny white jeans creates balance. Or if you decided to wear a loose top and wide leg pants, tucking in your top will create a balance. Can’t find the comment form! Anyway… I’d guessed that you were going to talk about pattern and texture! 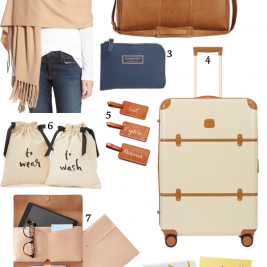 Loving this… you may see me stealing a similar look after the holidays!! I love winter whites! Haha, looks you found the comment form! Thanks Amber! Winter whites are the best! I think there is nothing more chic than a monochromatic outfit! Love this look and your tips, especially about mixing texture! Great tips! Love that sweater! So cute! 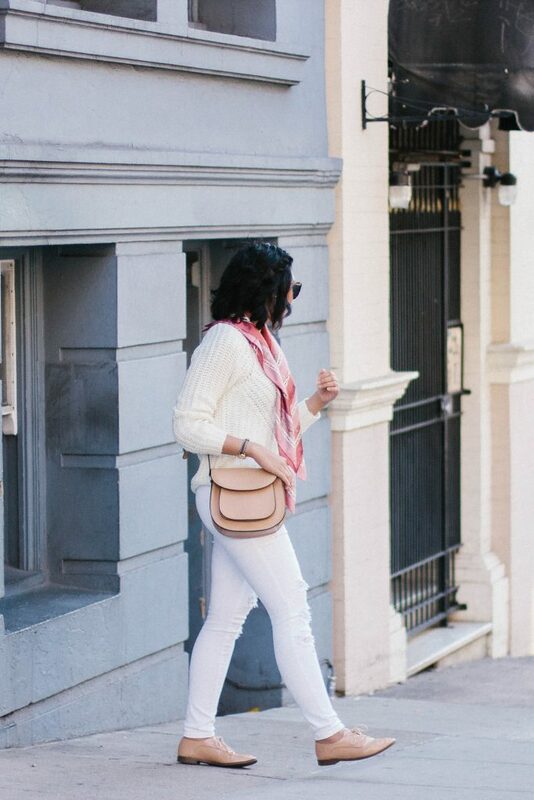 I have a white sweater but have never paired it with white jeans. I’ll have to try it out! yaaas! white. all. year. love this look! I love your winter white look, so chic and cute!! You nailed it! Lookin good babe. 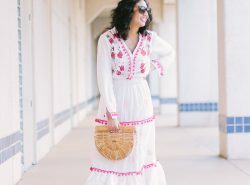 Your site is looking fantastic and I love this monochromatic white outfit! 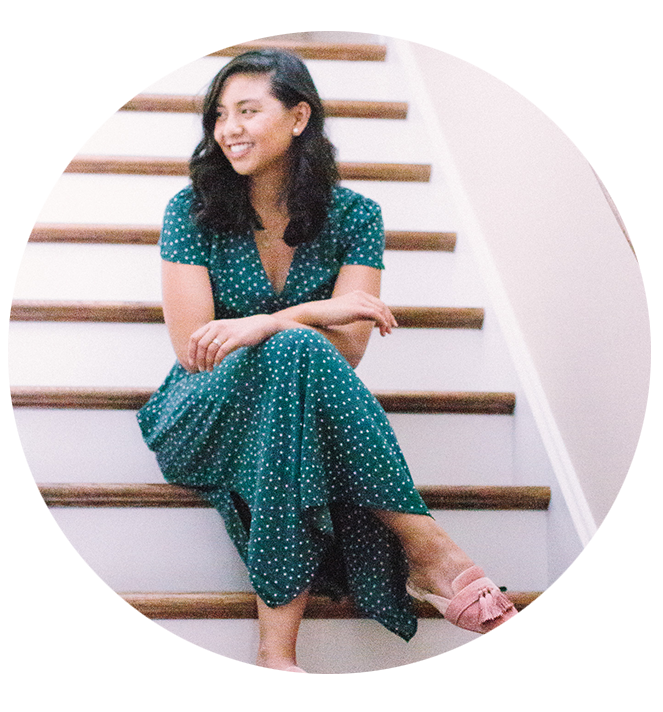 I know the transition to word press isn’t easy but it’s definitely coming together for you! Love it all. Thank you so much Heidi! I really appreciate it! I absolutely love winter whites!! Such a beauty, my friend!! Yea wearing white can be difficult. Always worried that it’s going to get stained so you’re definitely being a daredevil, lol. 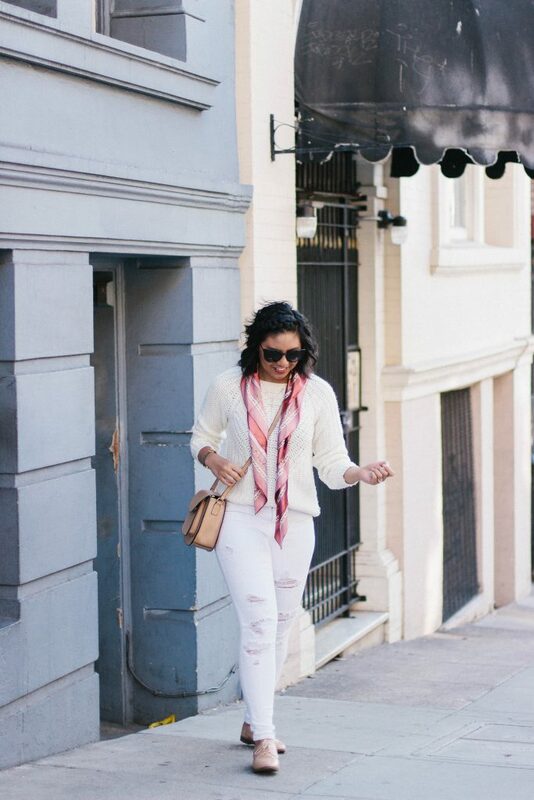 I love that you added the scarf to this all white monochromatic look! Haha this is probably the most daredevil I will ever be! Monochromatic looks are my go to because of their ease to style and how well they work for so many events. You look so chic in this look! I love a good all white outfit! this one is so cute! Such a beautiful monochrome outfit. The pink accent scarf definitely adds to it though! Perfect styling! Texture is so key here! 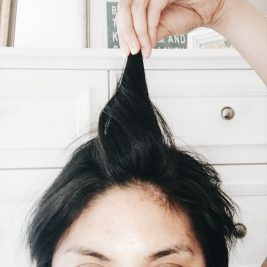 Great tips and I love your whole look! Great look, y buenísimos los consejos que nos das para usarlo. Yo también soy de ponerme blanco completo y en Chile me decían “de blanco va la patuda” que es decir te vas a manchar y nunca me manchaba jajajaja. Great outfit, I love how the scarf brings a little colour to it and how it highlights your face! Haha!Glad you find it funny! Oh I’m sure it must be hard! Thanks Mica! Loving the all white! It’s so effortless chic! Oh I LOVE this! my go-to monochrome outfit color is usually black. Unlike you, I’m not a daredevil because I’m way too clumsy to wear all white haha! 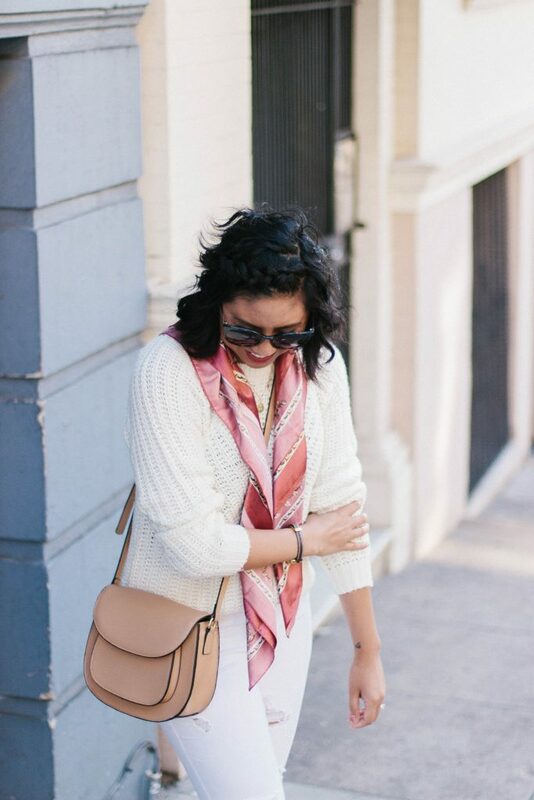 I adore the scarf you paired with this look, it’s so pretty! Black is another great monochromatic look! Thanks Deborah! You look so cute! Very nice outfit ! I love monochromatic white, in fact, I just love all white. It’s by far my favorite color! You look so great in this! Love the all white look. I love wearing all white all, too. Love this outfit on you. Love this all-white outfit, you look awesome babe! 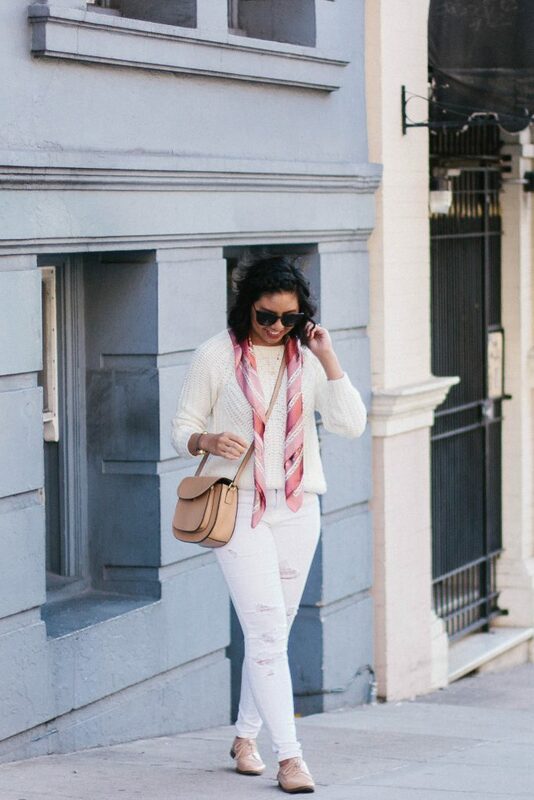 There’s nothing better than a winter white outfit. One of my favorite looks of yours! amazing tips dear! love the total white outfit!! I love monochrome outfits. You look great in this! I love white!! thanks for sharing!! Thanks Cris! Hope you have a good one too! You looks super! i really like the white shade and specially love the sweater the way of styled this looks so amazing. such a pretty look & great tips! love the scarf with it! This is really on point dear. 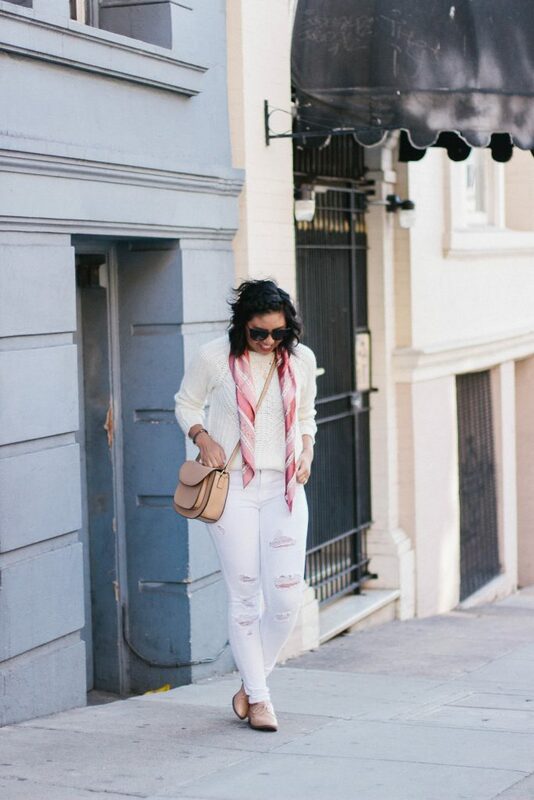 I love how the scarf, really pops out of your outfit. Simple accessory that can make a world of difference in the look. Thank you so m much Jessica! I am obsessed with all white looks. I love them so much and you definitely pulled it off Rach. Lovwe how you styled it. Monochromatic outfits are just so classic and pretty! Love this one!